The study of nutritional supplements has become increasingly important within orthodox establishments throughout the world, and as the market for these products continues to grow, so does the need for comprehensive scientifically sound information about the products, their properties s and potent6ial health effects. 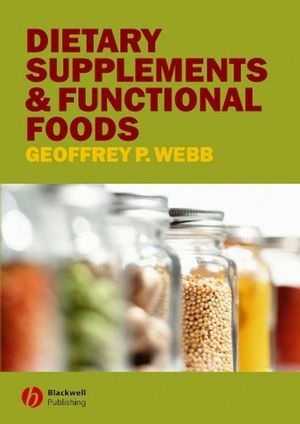 Geoffrey P. Webb, in this exciting and most useful new book, not only looks at the accepted uses of dietary supplements, such as the us of fish oils in the prevention of heart disease and arthritis, but also explores the wider picture, identifying common themes and principles or particular categories of supplements. Dietary Supplements and Functional Foods provides an excellent introductory text on this fascinating subject. An invaluable source of reference for students and professionals in nutrition, dietetics, nutritional therapy, food science and technology and other health profession including nursing, pharmacy and pharmacology. Personnel within food and pharmaceutical companies involved with supplement and functional food development and all libraries in institutions where this subject is studies and taught will find this book an important additional to their shelves. Dr Geoffrey P. Webb is senior lecturer in Nutrition/Physiology in the School of Health & Bioscience, Univerity of East London, UK. 1. An overview of dietary supplements and functional foods. 2. An overview of micronutrient adequacy. 5. Free radicals and antioxidants. 6. Natural fats and oils. 7. Non-essential nutrients that are used as dietary supplements. 8. Natural products and extracts.